We are working with communities in South London to bridge the digital divide and enable everyone to access the benefits that getting online can bring. Just some headline figures from this infographic above are that of this number 49% of the people 'off line' areregistered disabled; 61% are over 65 and 42% earn less than £12,500 per year. We all know what a difference using the internet makes to our lives - love it or loathe it - there is no getting away from the huge impact it has. Researching information, finding cheap deals for insurance, gas and electric bills, holidays, buying food, clothes, ordering repeat prescriptions. The list goes on and on. 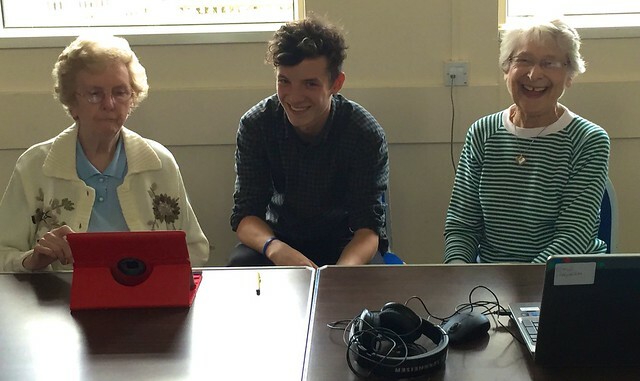 Can you spare 6 hours a month to support local people get online? We run a drop in session twice a month at Piper Hall, on the Cambridge Road Estate - where we have a great group of learners who need some help in gettting the skills to get them online. The sessions always run on a Thursday between 1 and 4.30 in the afternoon. The good news is if you would like to give us more time, then we would be very happy to offer you more. Using the learnmyway online skills training site, we help local residents to get to grips with using the internet and all it's many activities. We are looking for people who have an interest in helping people learn. You don't need a teaching degree - just patience and the ability to reassure, motivate and explain to our learners. Have a look at how we do this on Technology Thursdays on the Cambridge Road Estate? Can you help? Are you familiar with PC hardware? You don't have to do any of this if you only want to help out with the basic skills training! We register all our champions with the Learmyway online learning platform, so you can experience how it works. You will never be left alone to run a session. Our training lead Philippa Leary and ICT Support Worker will always be on hand. From a couple of days a week to just a few hours to spare. "Dear Kate, I hope this finds you were. I have some mixed news.Have managed to get a 6 month IT support contract starting tomorrow which hopefully is the start of good things. But unfortunately it means I won't be able to come to the office to help out anymore. Have really appreciated the help and support you have all given." You can read about some of our volunteers in this PDF. Call Community Connected on 02 8255 8040 or download Community Connected's volunteer application form "Interested in volunteering with us and being a Digi Buddy"
Theresa volunteered at Tech Thursday drop in for once a month for six months. As a employee of RBK, she took advantage open to all employees of an opportunity to volunteer for up to 3 working days per financial year. The councils encourages its employees to volunteer becasue it offers many benefits, such as improved health and well-being and improved job satisfaction, morale, commitment and performance. Gillain has been volunteering for Go Kingston Volunteering for over two years as a volunteer adviser. She has always been interested in technology and so it seemed natural progression to us that she might want to come and help out with our online skills training.